We have added two promotional photos of the new upcoming “The Goldbergs” spin-off that got the title “Schooled“, in which AJ Michalka will be playing a role of Lainey Lewis, whom you might have seen in the ABC‘s show “The Goldbergs“. We already told you about her role in this show in the article on our site. 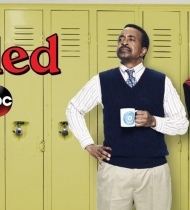 The Disney-owned network has handed out a 13-episode series order for the 1990s-set spinoff formerly known as Schooled. Additionally, former Goldbergs series regular AJ Michalka, who plays Barry‘s (Troy Gentile) ex-girlfriend, Lainey, has joined the cast of the untitled project, which has been retooled after original star Nia Long was no longer available. (Long is a series regular on CBS‘ NCIS: L.A.) The series will air during the 2018-19 broadcast season and follow the teachers of William Penn Academy — led by Tim Meadows‘ Principal Glascott, Bryan Callen‘s Coach Mellor and Michalka‘s Lainey Lewis — who, despite their eccentricities and crazy personal lives, are heroes to their students.